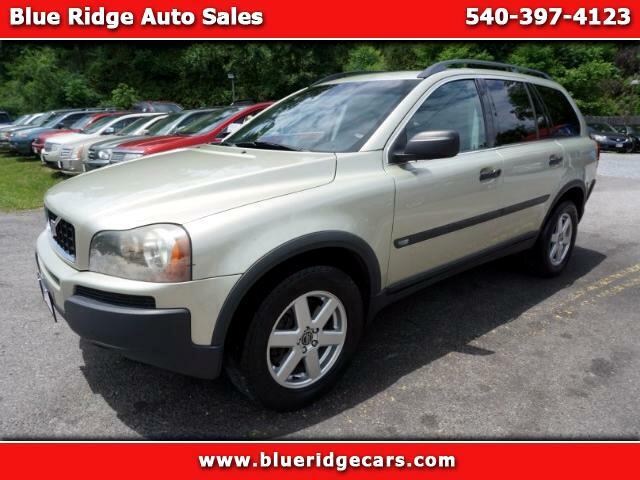 2006 VOLVO XC-90 SPORT UTILITY 4-DR , HAS EXCELLENT CONDITION, RUNS GREAT,ALMOST 4 NEW TIRES, AND STATE INSPECTION. Blue Ridge Auto Sales Inc., in Roanoke, VA, is proud to serve customers throughout the area. It is our goal to be the dealer of choice for customers who call Roanoke 'home'. Blue Ridge Auto Sales Inc. is conveniently located at 587 Blue Ridge Blvd. (1 mile from bonsack walmart 460 ) We look forward to taking care of all of your needs for your vehicle purchase. Come by our dealership and see our great selection of pre-owned cars, trucks, and SUVs. Call us at Mobile(540)397-8120 (540) 397-4123 Office 540-977-1771 , or email us in the box to the left of the pictures. We hope you have a tremendous 2016, and we look forward to serving you the best used quality cars in town and throughout the states we thank you. Message: Thought you might be interested in this 2006 Volvo XC90.